Projector Point has been operating since 2001 and today we are one of the largest online suppliers of AV equipment in the UK. 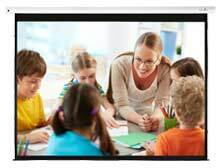 We specialise in digital projectors and accessories, including lamps, screens, cables and mounts. Buying a projection system can be a daunting task, but with our focus on knowledge rather than sales, Projectorpoint’s experts are here to help you make the right decision. Our goal is to recommend the product that’s best for our individual customers, not for us. Much of our business comes from word of mouth, so customer service is very important to us. Our advisors are fully trained and have hands-on experience with our wide range of projectors. With a genuine passion and interest in technology, our team are much more than just box-shifters. We provide buyers with impartial advice via our website and our freephone helpline every day. Projectorpoint is an approved reseller for the biggest names in the projector business, including Barco, BenQ, Canon, Christie, Digital Projection, Epson, Sony and more. We offer a huge selection of projector models from entry level to high end, ranging from home cinema and classroom use, to meeting room and auditorium settings. We have also achieved a number of manufacturer accreditations, so when it comes to projectors, you can rest assured that we offer a full range of choice. Unlike many of our competitors, here at Projectorpoint we have demonstration facilities at our office. We have dozens of projectors ready to try out, but if you’re interested in a specific projector then just get in touch, in most cases we can order in the exact model you’re interested in. Our projector demonstration space is all set up with two fixed frame screens placed side by side to allow simultaneous projector comparisons. The light in the demo room can also be adjusted from fully blacked out through to high light pollution, and a range of media players and games consoles are on hand to demonstrate projector quality. We are very proud to offer our customers the ‘Projectorpoint Promise’, which is our unique re-assurance guarantee. The Projectorpoint Promise allows you to use your new projector for up to one hour’s lamp use to check that you are completely happy with it. If you decide you’re not satisfied you can return it to us within three days of delivery and – as long as the packaging is in perfect condition – we’ll give you a full refund. No other online projector specialist is able to offer this level of guarantee. Typically we hold over 600 projectors together with a wide range of projector screens and other related accessories in our own warehouse located near Heathrow. As we hold large stocks of projectors ourselves, our expert sales staff have had hands-on experience with many of the projectors we sell. We also have a technical department to provide our sales team and customers with technical backup before and after purchasing equipment. If you want advice on the right projector for your individual circumstances, our team are ready and waiting to share their knowledge and advice with you today.